CAN 2.0 VIP is an advanced solution in the market for the verification of CAN 2.0(A & B) implementations. It is adherent with CAN 2.0 VIP (plus addendum specification) and it supports all frame types such as Data, Remote, Overload and Error frames. 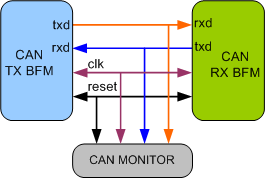 The CAN VIP monitor acts as powerful protocol-checker, fully compliant with CAN 2.0 specification. CAN 2.0 VIP includes an extensive test suite covering most of the possible scenarios and CAN conformance norms. It can perform all protocol tests as testbench Bosch and moreover it allows an easy generation of very high number of patterns and a set of specified patterns to stress the DUT. Adherent to CAN 2.0 Part A & B Specification and ISO/DIS 16845(Conformance test plan). Supports CAN with flexible data rate. Supports Full Duplex of operations. Supports test cases as per standard. Supports all types of frames. Automatic transmission after reception of remote transmission request (RTR). Automatic receive after transmission of an RTR. Supports all types of error insertion and detection. Tracks TEC/REC error counter and fault states. Supports Glitch insertion and detection. Callbacks in node transmitter, receiver and monitor for user processing of data. CAN Verification IP comes with complete test suite to test every feature of CAN specification and Conformance test plan ISO/DIS 16845. Functional coverage for complete CAN features. Faster testbench development and more complete verification of CAN designs. SmartDV's CAN Verification env contains following.